The Snowflake Lift right outside the Tyra Riverbend Lodge condos for sale makes the Fourth Phase of Tyra a real Breckenridge gem. 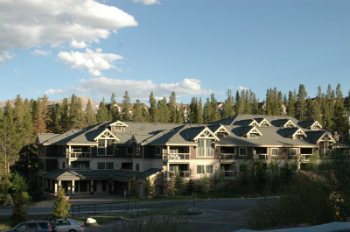 One of the best-kept treasures of staying slopeside in Breckenridge is 4 O’clock Run. It’s not a run skiers choose unless they’re headed home or down to town, and in the days of slow double-chairlifts that was usually at the end of the day, around 4:00. But nowadays, even a home-cooked lunch is convenient because, from Tyra Riverbend Lodge, skiers can cruise onto the Snowflake Lift and get back up to the array of runs on Peaks 8 or 9. Find out more about this unique development, or check out the Tyra Riverbend Lodge condominium listings below for available homes. Three previous three phases of Tyra were the first construction this high on Four O’clock. Since then, several high-end subdivisions have filled in the vacant private land. Neighbors include Trappers Glen, Snowflake, Snowy Ridge and other exclusive subdivisions. All the condos in Tyra Riverbend Lodge can generate good short-term rental income by virtue of their excellent location. They’re ski-in, by way of Four O’clock Run, and ski-out – with the Snowflake Lift. The free town bus also stops at the base of this lift. 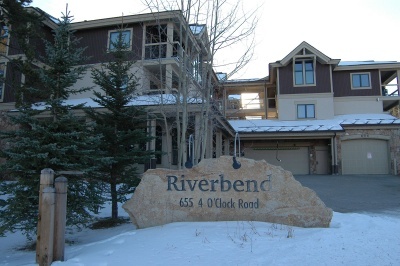 Tyra Riverbend also has all the advantages of a contemporary ski lodge: fitness rooms, lounges, media centers, meeting rooms and underground parking. In the summer, 4 O’clock run and the snow cat roads on the ski mountain are great trails for biking, hiking or wildlife spotting. A few hundred yards above Tyra is the Breckenridge Outdoor Education Center and the small Sawmill Reservoir. Several trails begin at the lodge at the BOEC and connect to other trails that extent far into the national forest. HOA: Tyra IV Riverbend Homeowners Association: www.gwlhoa.com. From Park Avenue in downtown Breckenridge, drive one-half mile up (west) 4 O’clock Road. Tyra Riverbend Condos will be on the left just before Tyra Summit. An expert from Breckenridge Associates is waiting to speak to you! Send us a message, or call us at (970) 453-2200 to get the conversation started.